Bio-inspired robotics research continues to pave the way for future military applications. 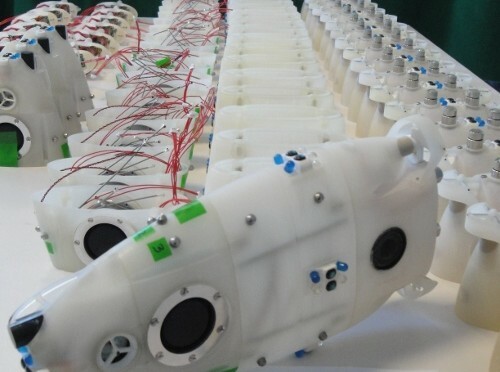 In 2012, researchers proved that Autonomous Underwater Vehicles (AUVs), could perform simple swarming functions. We’ve discussed that technology and its implications for naval use in a post here. CoCoRo (Collective Cognitive Robots) is a consortium of European universities led by the Artificial Life AL in the Department of Zoology at the Karl-Franzens-University Graz engaged in developing autonomous swarms of underwater vehicles to monitor, search, and explore the underwater realm. As seen in the above video, their AUVs demonstrate novel underwater communications methods and simple swarming behavior. CoCoRo is building 20 copies of its newer AUV, “Jeff,” which can maneuver rapidly underwater and dock to a floating surface station for battery recharging and data transfer. Jeff is equipped with multiple communication tools including flashing blue LEDs, pressure wave, and sensors for potential field, obstacle avoidance, and shoaling. Although small in scale, these experiments might prove useful to the development of a future generation of collaborative UUVs performing a variety of naval missions. Autonomous vehicles cooperating across various ocean depths will be useful for real time hydrography and to characterize acoustic propagation – a critical factor in antisubmarine warfare. Mine countermeasures is another obvious mission, along with autonomous swarmed attack against surface or sub-surface platforms. This article was re-posted by permission from, and appeared in its original form at NavalDrones.com. Every Drone Can Be a Minesweeper? A frequently cited fact in my days training to be a naval officer was that the most common weapon for damaging a warship since World War II was the naval mine. The recently concluded International Mine Countermeasures Exercise 2012 (IMCMEX 12), held in 3 distinct OPAREAs throughout the U.S. Fifth Fleet Area of Responsibility (AOR), demonstrated both the difficulty of mine countermeasures (MCM) operations (detecting and clearing mines) and the potential of new technology to mitigate those dangers. The Navy declined to provide data on how many practice mines were located during the two-week naval drill but did not dispute that less than half were found. However, a spokesman insisted that the figures do not tell the whole story and that the event was “‘not just about finding” the dummy mines. While it is true that a 100% detection rate is not what the exercise was all about, that rate is still an interesting figure. It could indicate that every mine was found, but perhaps not by every platform – instead as a result of the cumulative MCM effort. It’s likewise unknown how the success rate broke down by platform and nation – more than 27 international partners operated with U.S. Fifth Fleet as part of the exercise. What is known is that MCM remains a difficult and deadly business, particularly in the context of some of the most likely future conflict scenarios, including Iran and North Korea. While the exercise results will disappoint some (again, we don’t know who or what had difficulty finding what types of mines), they will also serve to reinforce the arguments for recapitalizing the Avenger-class MCMs, outfitting the USS Ponce as an Afloat Forward Staging Base, and placing rigorous demands on getting the LCS MCM mission package right. As mentioned above, the exercise was additionally an opportunity to test out some new kit. Before the exercise got underway, NavalDrones provided a preview of some of the Remotely Operated Vehicles (ROVs) and Autonomous Underwater Vehicles (AUVs) slated for testing in the drill, as well as a recap of other drones designed for MCM duties. Furthermore, a pair of similar threats might spark the development of crossover technology for use in MCM. In addition to the more traditional types of naval mines, detecting and defeating the waterborne IEDs and enemy drones (AUVs and ROVs) of both state and non-state actors is seen by some as increasing in importance, and may rely on many of the same technologies used in MCM. Like the land-based IED/counter-IED arms-race of the past decade, we could be witnessing the start of a similar set of opposing innovation escalations. Foreign Policy earlier this week reported that the creation of the Iraq/Afghanistan wars, the Joint IED Defeat Organization (JIEDDO), is executing its own Pivot to the Pacific to focus on the typically lower-tech threats of waterborne terrorists and IEDs. Meanwhile NavalDrones last week highlighted some of the detection and clearance technologies that could be used against the evolving undersea drone fleets. The next decade is shaping up to be an interesting time for technology under the waves. As the recent Israeli shootdown of a Hezbollah UAV reminded us, it is relatively easy to destroy an unmanned aircraft. But what about the proliferating numbers of unmanned undersea vehicles? The growth in these systems for naval applications will inevitably result in the requirement to counter an adversary’s underwater drones. Detection of a small man-made object moving underwater is not trivial, but also becoming easier with the advent of technologies such as high-resolution imaging sonars and Light Detection And Ranging (LIDAR) systems. 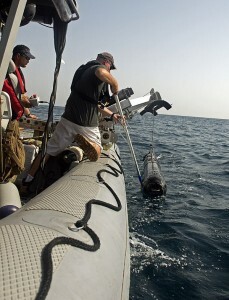 However, once an AUV is detected, how can it be destroyed? This problem set isn’t new. Mini-subs and combat swimmers have threatened ships in port since World War II. The old school way of dealing with frogmen is to drop a concussion grenade over the side of a boat. Alternatively, some navies have experimented with dolphins to counter swimmers. 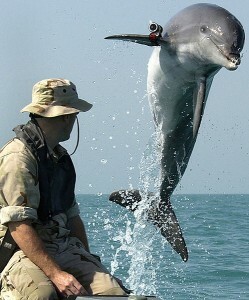 These sorts of mammal-based systems could conceivably be trained to work against AUVs. Other advanced technology developments will allow mammals to stay out combat. Super-cavitating bullets, like those produced by US-based PNW Arms and Norway-based DSG Technology (see video) offer a potential weapon for defeating AUVs. According to PNW Arms, “supercavitation is the use of cavitation effects to create a bubble of gas inside a liquid large enough to encompass an object traveling through the liquid, which greatly reduces friction drag on the object and enables the achievement of very high speeds.” DSG Technology’s Multi-Environment Ammunition allows ordnance ranging in size from 4.5 mm through to 155 mm to transit from air to water or vice versa. Conceivably, AUVs could be detected and engaged from the air. The U.S. Navy’s AN/AWS-2 Rapid Airborne Mine Clearance System (RAMICS) technology demonstrator used a helicopter equipped with a blue-green LIDAR to locate mines near the surface, then a 30 mm super-cavitating round to neutralize them at depths of up to 60 meters. The program was cancelled in 2011 due to technical and budgetary issues. Super-cavitating rounds also open up the possibility of hunter-killer unmanned undersea vehicles, guarding a port from other AUVs, mini-subs, and swimmers. Submariners often remind other sailors that the best ASW weapon is another submarine and the same may be true with AUVs. However, discriminating between an AUV and a similarly sized fish or marine mammal before pulling the trigger might be difficult without some sort of corroborating data, or image recognition algorithms. This article was re-posted by permission from NavalDrones.com.